Its the 2004-2005 hurricanes all over again. Remember the dire warnings after Katrina that the U.S. was in for more more and bigger hurricanes? We are repeating that news theme with the ongoing winter storms in the East. I went on the read the rest of his resume and he is not published in the field of atmospheric science. Nevertheless, NBC put him on the air as an expert in the subject of why the East is having so much snow. What did he say? First he told us the heavy snow was due to "global warming." Then, he corrected himself while answering the next question and said it was not global warming but "global swings" (whatever those are). He said there were [around the world] "droughts simultaneous with floods." He added, "All scientists believe the earth is heating up." "Last year was the hottest ever... get used to it, we are going to have more monster storms." The hottest year is 1998, 2010 isn't even close. 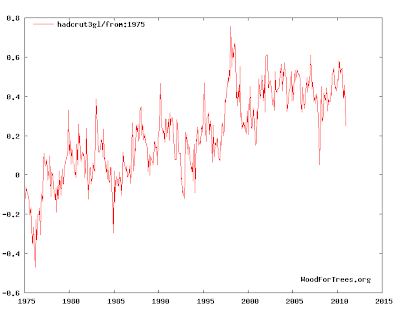 The data shows (again present tense) the earth is not heating up at present, nor has it heated the last 14 years. If anything, temperatures are headed down. The more important metric, ocean heat content , is also trending down. So, the basic premise of Dr. Kaku's position is incorrect. As to "droughts occurring with floods," that is usually the case due to an atmospheric phenomena known as "teleconnections" which means that when (for example) an unusually strong low pressure center forms somewhere (and causes, say, floods), an unusually strong high pressure center (causing a drought) will form somewhere else. Dr. Gulledge earned a PhD (1996) in biological sciences from the University of Alaska Fairbanks and M.S. (1991) and B.S. (1988) degrees in biology from the University of Texas at Arlington. It would be nice if the television media actually quoted someone who knows something about how the weather (which is what the Northeast storms are) actually works. ADDITION: Dr. Ryan Maue comments on a later interview by Dr. Kaku on CNN. Not quite sure what to make of the oxymoron "Warm Arctic" though!! I saw that segment on the Today Show this morning and immediately thought of you. Thanks for your post! I was watching the Today Show this morning and nearly fell out of my chair when Dr. Kaku said "all scientists" believe the earth is warming! Yes, meteorologists tend not to believe the Al Gore/IPCC hypothesis that global warming is a huge immediate problem. Geologists (who study the history of the earth), I have found, are also deeply skeptical. For any new readers I wish to clarify: It is possible that GW is a significant problem but the science, to this point, is so tainted by advocacy and (in some cases) poorly done, it is impossible to tell. There are good reasons to believe the earth will cool (it is cooling now) further over the next 2-4 years. The IPCC has forecast consistent warming. If it warms to IPCC levels in spite of the "cooler" sun, La Nina, etc., then I would say their hypothesis would be confirmed to the extent action needs to be taken. If the earth continues to cool, in spite of their warming forecasts, it is falsified.